Regular buses in Mumbai do not offer the direct trips, wifi, and power outlets that are offered by the new commuter bus service. Photo by Lecercle. Mumbai is an island with little room to grow laterally. Greater Mumbai is a linear landscape with limited arterial roads, developed along suburban train corridors. In the past few decades, businesses have moved from their concentration in South Mumbai to other areas in central Mumbai – such as the neighborhoods of Worli, Parel, and Laulbag – and to the suburbs. As these businesses have moved, so have residential neighborhoods: Mumbai’s population has spread to the North and to the East, causing long commutes by car for those whose offices lie on the other side of the city. Given the space constraints, traffic in Mumbai often becomes a knotted snarl, and with the pressure of vehicular traffic increasing, Mumbai faces a daily rush-hour gridlock. 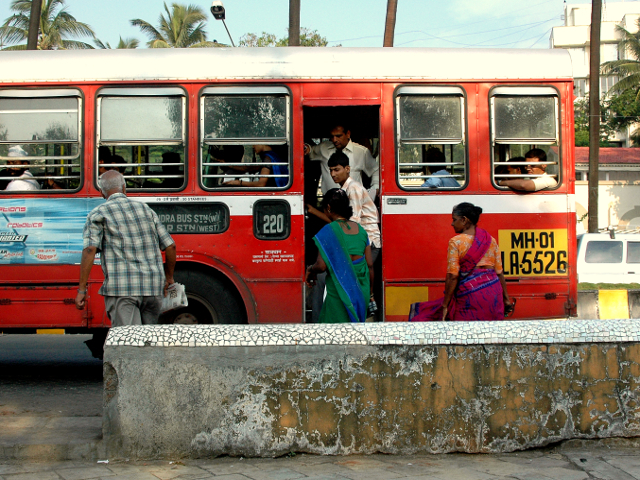 In an effort to alleviate the situation, the Mumbai Transformation Support Unit (MTSU) (established in 2005 as a special unit of the All India Institute of Local Self Government with the support of the Cities Alliance, the World Bank and USAID) conducted a study on how to best serve the needs of the newly shifted population with bus services. The aim was to provide an attractive and reliable air-conditioned bus service directly from residential areas to business districts, reducing congestion and travel time while weaning car owners away from driving. EMBARQ India designed the technical study, using surveys and fare-data from existing bus users to identify commuter needs and potential new routes for what is commonly referred to as “point-to-point” bus services. On July 11, the pilot bus service Shivneri Corporate was launched by the Chief Minister of Maharashtra, Prithviraj Chavan. Two pilot routes have been introduced so far, both carrying passengers directly from the north western suburb Kandivili to the Bandra Kurla Complex, a large commercial hub in the southern suburbs of Mumbai, about 19 km (12 mi) away. The new service provides safety and comfort: the buses are fitted with free Wi-Fi, GPS tracking, and mobile phone charging stations. On Shivneri Corporate’s website, the picture of a frustrated man is accompanied by the caption “Still driving yourself to work?” The success of the pilot program hinges on its ability to attract private vehicle users to use this new high quality service. Because the buses are “point-to-point” they don’t stop anywhere along the way, which speeds up the trip considerably. But the bus still has to navigate through normal traffic, which, during peak hours along the bus’s route on the Western Express Highway can be painfully slow. Unlike a true advanced bus system – in which buses would have their own lane – the point-to-point bus service will likely struggle with reliable frequency of buses and trip length. Mumbai City bus services (BEST) still runs normal buses connecting Kandivili to the Bandra Kurla Complex, but they are not point-to-point and they do not offer any luxury facilities. The new bus system’s perks work to lure former car-commuters into a more sustainable mode of transport. In order to grow the current luxury system to a larger scale, the integration of the two bus service providers will be essential. While the new pilot is a good step towards solving the city’s traffic problem, it points to the urgent need for an advanced bus system in Mumbai that can carry a large population from one end of the city to another, and quickly. A bus rapid transit system in Mumbai would complement other transport solutions already in place, such as the city’s suburban rail and metro services. Together, these systems could go a long way in reducing Mumbai’s dependence on private vehicles, alleviating the snarled gridlock the city currently faces.